Scorpions, and nectar, and crickets, oh my! 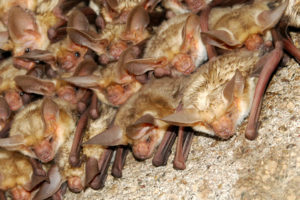 A beautiful pile of pallid bats. Photo by Geoff Gallice at Wikimedia Commons. Hi everyone! I hope you all had a good week! People in California have been having a hard time. They are having some really bad wildfires again. This week’s blog is dedicated to all the people in California affected by these fires. I found a handsome bat that lives in California called the Pallid Bat. I think I have written about this bat before, but it is so cute that I thought it would be nice to read about them again. This bat also lives in British Columbia all the way down to central Mexico. They also live as far east as western Texas, Oklahoma, and southern Kansas. The Pallid Bat is found in deserts, rocky places, oak and pine forests, and farmland. These bats like to roost in caves, rock crevices, mines, hollow trees, and buildings. These adorable bats have light brown fur with pale white fur on their stomachs. They have special glands on their face, much like the glands of skunks. The glands produce an odor just like a skunk’s too. They use this odor to defend themselves. The Pallid Bat has an amazing adaptation. Unlike most bats, the Pallid Bat does not eat their food while flying. They land and then eat! They swoop down on their pray, and then carry their meal to a safe perch where they can eat it. These bats feast on crickets, beetles, grasshoppers, and scorpions. Most North American bats aren’t big enough to safely take down a scorpion, but these fluff balls are actually immune to a scorpion’s sting. If you would like to read more about these bats, you can find information here. Next StoryLips of bulldog, cheek of chipmunk, toe of ? ?